This is the back story to the award-winning book, Better Thinking, Better Results. 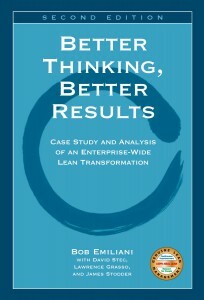 The Wiremold Company’s Lean transformation was featured the book Lean Thinking (published in 1996). It was one of five short chapters highlighting successful Lean efforts. At that time, Wiremold’s Lean transformation, led by the President and CEO, Art Byrne, was barely five years in the making. In 1999, I left industry and became a full-time faculty member at Rensselaer Polytechnic Institute’s Lally School of Management and Technology, Hartford, Connecticut, campus. Rensselaer was located just six miles from Wiremold’s headquarters in West Hartford, Connecticut. Having read Lean Thinking in 1996, and now having joined the faculty of a university, I decided to research Wiremold’s Lean transformation in much greater detail than has been presented in Lean Thinking. There was much more to the story than what was presented in Lean Thinking, particularly in relation to Lean leadership and application of the “Respect for People” principle. In early 2001, I approached Orry Fiume, Wiremold’s vice president for finance and administration, about doing several Harvard business school-style case studies on various aspects of Wiremold’s enterprise-wide Lean transformation, from its start in 1991 to 2001. He me asked me to prepare a short proposal that he could present to the management team for discussion. I sent the proposal to Orry, and a short time later he told me that the management team had agreed to participate in creating the case studies. Concurrently, I sought the participation of other Rensselaer faculty in this project. Several agreed to become part of it. Data gathering included Wiremold internal presentations, various financial and non-financial documents, and interviews with 12 Wiremold senior managers. Interviews were led by a Rensselaer faculty member, each six hours in duration (two 3-hour sessions), in July and August of 2001. The interviews resulted in over 800 pages of transcripts. Shortly after the recorded interviews were transcribed, I met with Art Byrne and showed him the notebook. Art said to me, “You have enough material to write a book.” So we did. Rensselaer faculty then split up into two teams: I headed up the book team, while my colleagues, Martha Fransson and Larry Grasso, headed up the case study teams and produced wonderful case studies. The book was written between late December 2001 to early March 2002, and then underwent four months of reviews by nearly 20 people and several rounds of edits. The book was completed in fall 2002 and published in January 2003. Better Thinking, Better Results was the first book to describe an actual enterprise-wide Lean transformation, complete with detailed financial and non-financial results. And, it was the first book about Lean management to be manufactured using print-on-demand technology; meaning, sell one, make one. The book won a Shingo Research Award in 2003, and remains the premier book on the topics of Lean leadership and Lean transformation. A second edition of Better Thinking, Better Results was published in 2007 to bring the story up-to-date, as Wiremold underwent a change in ownership and changes in management post-2001. I was criticized by some major figures in the Lean community for producing the second edition because it described how Wiremold’s Lean efforts quickly backslid under its new owner. It seems that these people thought writers should present only Lean success and not discuss failure. But, my rationale was that people should know how Lean can be undone and what they can do to avoid such an outcome after years of great work. In truth, the second edition is more valuable because it not only teaches leaders how to succeed, but also how to avoid failure. Overall, it was a very productive project. But more importantly, we produced a book that has helped a lot of people by giving them a clear, practical vision of what can be achieved, how to achieve it, the results they can expect, and insightful analysis that contextualizes and expands on the great work that was done by Wiremold’s leaders and all the employees.